Cheerilee smiled as she slid open the curtains to the classroom, letting in the sunlight to brighten the room. The desks were still covered in a light layer of dust from sitting all winter, but that wouldn't take too long to clean. After all, the hardest tasts of the schoolroom had already been done. The blackboards were wiped clean, and the floor swept bare. Her easel with its giant pad of paper stood at the read with a fresh sheet flipped up for the day's lessons, and Ponyville's teacher couldn't be prouder of her job. She always loved seeing those bright and smiling faces every morning, but none moreso than on the first day of school! Oh sure, a new filly would need some consolation from being homesick, or there'd be a colt who proved to be a little too unruly, but there hadn't been a foal yet that hadn't eventually found their place in her class. She could never give up on a young pony, and making them cheerful by the end of the day was her heart-given mission! And she'd sure do her best to make sure every pony went home with a little bit of it in their saddlebags after school let out. The mare began humming to herself a merry little tune she'd heard from Fluttershy one morning, and it'd just stuck in her head and she'd been humming it for at least two days now. And it never got old! Cheerilee walked up and down the aisles between the desks, straightening the benches polished from so many years of pony rumps sitting on them, and the desks with their scratches from years of pencils working their surfaces through a thin layer of paper. Each one had its story to tell, each one had seen so many students. Why, this very one here. This was her desk when she was just a little filly, even before she had her cutie mark. Cheerilee gazed at the little desk with love. Had she really been so small as to fit at that? She surely had! Leaving the desk for her apprenticeship as assistant instructor and later to take over the job when her predecessor had retired had been one of the hardest things she'd ever done, but she never looked back with apprehension. Instead, she always looked towards the future! After she'd finished her tidying tasks and was satisfied the classroom was ready for the morning's lessons, only then did Cheerilee open the door to the school and ring the bell at its peak. Soon her sweet students would be arriving, and she was so looking forward to hear what they had been doing on their Summer Vacations! Her first lesson for the year: A short essay on what each pony had done. She always loved to hear their stories! And they were always such great practice. This year was going to be a great one, Cheerilee felt! He was both excited and nervous for seeing everypony again after the summer months, it'd be great to see them...but...he guessed they all had so much to do and it would probably put his summer to shame. Never the less, as he heard the bell ringing away he had to be stopped from rushing to far ahead by his aunt until they reached the path leading into school, with an affectionate snuggle between unicorn and pegasi he was nudged towards the doors of knowledge that would fill his tiny head today. Waving his aunt off, he watched as other little ponies excitedly made their way in aswell and he happily joined them in their playful cantering. A few playing ball whilst they played. But it seemed the marker for the entire year would be set as the little foal was nearly bowled over by the resident blue menace, his face skidding slightly into the dirt as he blinked akwardly at what the heck just hit him? When he looked up, he should've not been suprised by what he saw. Champ hated school. As most little ponies did when they had his mental approach to things, he dragged his feet as he passed the gate and stared at the school with a slight rasberry being blown past his lips. A cruddy summer here and a cruddy day was sure to be had, he only perked up when he saw the little white speck of a pegasi he loved to torment and he sped up with a nicker. Finding a small joy in seeing the little foal spin before making a small dirt trench with his face before he let ought a snorting laugh. That made his day. He'd be set for the rest of the day now and made his way inside, past the pink filly with little greeting other than a small grunt. Where was the desk he'd chosen again? Drawing himself to his hooves in the meantime, Starlight dusted off his face and then scampered his way into the schoolhouse. Smiling at miss Cherilee brightly as he clambered up the stairs, why oh why must he be so small. "Good morning, miss Cherilee!" He chirped happily and trotted inside with the others. She smiled as her students began to file into class one by one, some eagerly and others, not quite so. She loved watching the little foals play, it was much like reliving her fillyhood vicariously. They all were having so much fun playing games that were old long before she was ever born. She'd ducked inside for a moment to get her little schoolbell, used as a final signal for the younglings to let them know class was starting and set it on the banister beside her as she returned to the porch. She missed as Champ ran poor little Starlight over, but she didn't fail to notice how the bully colt dashed inside and resolved to have a word with him when she had the chance. As for Starlight, her face fell as she took in his rumpled and dirtied face. "Good Morning, Starlight!" she fairly sang, then noticed his appearance. "Oh, come here, you poor dear. Looks like we had a bit of an adventure before class! You're going to grow up to be such a important pony someday, I just know it!" she sat on the porch and pulled out the towel she kept in a box near the door for just such occasions. Little ponies came in all the time with mud or muck or other such unpleasantness on them, and they always seemed to feel much better in class when they were clean. So she dipped the towel in the bucket of rainwater and proceeded to clean Starlight's face for him. When she'd finished, she dropped the towel back into the box for one of the other students to take out later during cleaning time and let the little colt join his classmates as they entered the school. With a sigh, Grim Tales checked that his back was in place one last time. Sure he'd told Sweetie Belle and her friends that he didn't have his Cutie Mark yet, but he didn't want to go spreading that around. It really did bug him after all. So making sure his flank was covered he slowly made his way over to the school building. 'I don't know, Scribe... I'd much rather just stay home and study on my own. I wonder if school will be different here than it is back home.' He glanced to his bag for a moment. Scribe, his pet spider and writing assistant was tucked away inside. It wasn't a small spider either, so the box he was kept in took up one whole pouch of the saddle bag. Seeing his teacher as well as another foal on the school house porch, Grim trotted over. 'Good morning, Ms. Cheeilee... Starlight.' He remembered the other from the day they met under the tree. Grim was a bit unsure of his teacher though. Willow Wisp, his cousin, said she was a very nice mare when she met her to make sure he was signed up for class. Still, he hadn't met her yet and being the way he was, that made him nervous. The teacher's eyes twinkled as she caught sight of another new student approaching on the path in front of the school. This one was a little darker than the rest of her little class, but she was sure he just needed something bright and cheerful to turn that dour look into a smile. And sure as her name, she was going to make sure he had every opportunity! "Good morning, little Grim!" she called out to him as he approached. In answer to his question, she turned to indicate the classroom inside. "Oh, sit wherever you like! Most of the students from last year have preferred seats, and I let them return to wherever they are most comfortable for their lessons. Provided, of course," and she called into the room, knowing of at least one set of pony ears that needed to hear her. "They behave themselves!" She turned back to the little colt from where he stood. "If you like, there are a great many seats near the front of the class that usually are filled by last minute ponies, but I'm sure wherever you choose to sit will be fine. If you need to, I'm sure we can also arrange to move seats with another little pony if things aren't working out. Saddlebags go under your seat when they're not in use, and do be sure to keep a pencil and paper handy, notes are always encouraged! As long as they're for your schoolwork, I don't tolerate notes being passed in class between students during lessons." Cheerilee broke into a broad smile, her eyes closing into it. "But I'm very glad to have you here today! I think you're going to love today's lesson. I'll tell you all about it when class starts in a few minutes." Getting his face cleaned, the tiny foal let out a small giggle and smiled at the cheerful teacher as he saw all the dust and dirt on his face being wiped away. He wasn't really sure why Champ liked to pick on him, but he was pretty sure it just had to do with his size and such. Flapping his tiny wings so they sat outside of his small saddlebag his ears swivelled as he heard his name and blinked at the colt from the other day, smiling in faint memory as he was let go of and smiled thankfully up to Cherilee when she was done. Tottering next to the darker colored foal, he smiled brightly. "Hi Grim!" He chirped, following in to find his desk that he also had to scramble slightly to get onto, once he did however, he had a nice view of the chalkboard. Not a far away place in the back so that he could laze like a certain blue colt. The colt in question was readying a few paper balls to chew up and a straw to aid his weaponry as he watched the foals file in, glaring slightly at Grim as he entered but not doing much other than that as he stared forward with a dulled expression as he prepared his artillery. Shoving his saddle bag under his desk he watched miss Cherilee for a moment before rolling those orange eyes of his, a good lession, yeah right. Since when did school ever have any fun lessons? Cheerilee mussed Starlight's mane a little bit, then smoothed it, sending the little colt in with a gentle nudge. "Take a seat anywhere you like, Starlight." she waited until Grim had entered the classroom along with the rest of her students. Some she recognized, others were new faces, but all of them had been introduced to her by their parents at some point or another, well, for the most part anyway. The mare rang her 'Class is starting' bell and waited a few more minutes before she decided that all who were coming had arrived. She closed the door behind her, and drew the blinds over it, indicating class was in session. Trotting to the front of the class, she did a little twirl, allowing her tail to swirl around her before flashing her students a bright smile. "Good morning, class!" she called out to them, waiting for their response before continuing. "It's so good to see all of your bright, happy faces again for another year! For those of you who are just starting for the first year, I'm Miss Cheerilee. I will be your teacher for this school year and I hope we have many hours of fun together! Though not all of our lessons will be filled with fun, I'm sure we can make the most of those together. Now, some of you may remember the homework I gave you for over the summer. Just one simple lesson, and I hope we all managed to bring it with us today?" she looked out over the class for nods of acknowledgement. "Well, for those of you who did it, I'll take your papers in just a moment. For those of you who didn't, or didn't know, I think we can still manage." she walked to the board and picked up her chalk holder and began to write on the board in broad, flourished script. WHAT I DID OVER THE SUMMER was the heading. After she'd finished writing, she set the chalk back down on the edge of the board. "What we did over the summer." she repeated afterwards. Turning back to the class, she indicated the board with her hoof. "This will be simple, all I want from you, is for you to tell me about the best parts of the summer you had this year. Any new ponies you met, any new experiences you had. Does anypony want to go first?" As usual the little foal was late to class, but whatever she thought as she lazily beat her wings and held onto her scooter. School was usually boring anyway, and the first day was especially lame because of those what you did this summer essays. As she pulled up to the school almost crashing into the stairs she noticed the door was already shut. So Scoot just sighed and pushed the door open. As she opened the door Miss Cheerilee was already talking so she just took her usual seat in the back. The boring what you did all summer essay already written on the board. So Scoot took the opportunity to write all about the cutie mark crusaders, but made sure not to seem too excited about having to do school work. The teacher looked up as Scootaloo entered the classroom, and she tsk'd in disapproval. "Late on your first day isn't a good trend to set, Miss Scootaloo. Next time, try to be on time in the future? You might miss something important! I'll overlook it this time since it's the first day back." she began walking up and down the aisles, collecting the papers from those ponies who had chosen to written their summer essays and deposted them in a neat pile on her desk for later grading. Then she picked up the marker from the easel and carefully uncapped it, drawing a small line on the top left corner of the paper to ensure it was ready to go, before putting the cap back on. "Now, as I was saying, I would like to have some students come up to the front of the class and tell us about what they did over the summer, including any adventures they'd had. Learning to speak in front of a crowd is an important skill, and one of you might even be Mayor someday!" Cheerilee looked over her students and smiled. She was sure any number of them had adventures that would make for a great story. Maybe one of her future lessons would be to have them develop it as part of a creative writing exercise. She loved reading their essays, there was no better way to get an insight on each young pony's developing mind! So many students to choose from, though she waited for any one of them to raise their hooves eagerly to be first. "Anypony? I would rather not have to pick, but we have much more to do today! Sweetie Belle's tiny little legs churned as quickly as they could as she ran through town. She saw Scootaloo's scooter zip by just ahead of her and let out a quiet, "Nooo, waaaait!" As fast as Scootaloo was, she kept being late, which meant Sweetie Belle was going to be even MORE late! And it wasn't even her fault! Her big sister Rarity kept fussing over her and making sure that she'd be perfect for her first day back, and something about 'fashionably late', but Sweetie Belle didn't think that Miz Cheerilee had heard about being late being in fashion! Public speaking?! Oh NOooooo! Nooo, nooo, noooooo! She slipped behind the first empty desk and tried to hide low so that she wouldn't be picked! Miz Cheerilee couldn't possibly be mean enough to make her talk in front of the class, right? Cheerilee's back was turned as Sweetie Belle snuck into class just after Scootaloo. As she turned back around and noticed she had another student that had magically appeared, she gave a faint smile. They were so darling, always trying to pull one over on a pony...but she'd let this slide. Little Sweetie Belle was so shy in front of public that Cheerilee wondered if she'd be able to take part in the school pageant next month. Surely she would, after all that hard work they'd done for the Talent Show! She knew the Cutie Mark Crusaders wouldn't miss an opportunity to try to find their cutie marks yet again, and she wondered as always, what sort of antics they'd get into trying to find them. It was so cute! And she sighed a bit and rolled her eyes up to the ceiling of the classroom in mock exasperation, was every foal going to be late today? Surely -some- of her other students made it to class in time! "No volunteers?" she asked, waiting patiently for a moment. "Very well, Champ, what about you? Would you like to come up to the front here and tell everypony what you did over your summer? I'm sure you had a very good time playing with your friends, or going somewhere interesting, why don't you come up here and tell us all about it?" That inclination was stopped however as a wad of chewed, spit moistened paper splatted against his ear from a very well known source. Said source snickering behind him a few desks back, till everyone was distracted by the door opening up and that orange pegasi and sweet voiced unicorn from the other day walked in, causing the little pale foal to smile brightly at the familiar faces. This was shaping up to be the bestest first day back ever! Soon his attention was brought back forward, nobody wanted to speak up and so the inevitable was chosen and the little pegasi couldn't help but feel a little vindicated as he turned and saw a slight look of berudgement on the bully's face. "Aww jeez..." The upstart colt muttered before sliding from his desk with a grumble, hooves dragging behind him as he stared at miss Cherilee for a moment in an almost rebellious tone. Then again, if he got this out of the way, he'd never have to do it for the rest of the day. First and less painful. Scuffing his hoof against the straw laden floor he looked out over the rows of faces, eyes narrowed slightly. What were they expecting? Stupid foals...he didn't have to say nothin'...but the fact the teacher was overlooking everything, finally broke out Champ's spirit as he let out a long and painfully audibly bored sigh. "This summer..." He began in a monotonous drawl, ears flopped as he spoke. "I helped out my dad in his stupid Tiny Hooves Toy Shop and also unload more of the boxes we hadn't opened when we first moved here...it was the most boring time I've ever had, but when you're here what do you expect?" The colt spat out the last words sourly before glancing up to the teacher. "Can I go back to my seat now?" Cheerilee returned to behind her desk and waited as Champ reluctantly came to the front of the class. She made a mental note to speak to him about inappropriate items that would no longer be allowed in class. Along with the other things she remembered having to confiscate. Really, his father would have kittens if he knew how much of his stock invariably ended up in her drawer by the end of the day! That was another thing, four slingshots, a frizbee, a hoofball, two bouncy balls, a clacker...goodness, had she forgotten to give all of those back to their owners? It was a good thing she kept track of what belonged to whom. She nudged her drawer closed with a hoof as she perked her ears forward in eagerness to hear what he actually had to say for his summer. Surely, working in a toy store could be a lot of fun! But she was disappointed. She tried not to let her face fall as Champ's short story, barely a few sentences long, detailed very little but told volumes. Maybe she was being too hard on the foal. "Well, I would expect working in a toy store could be a lot of fun. Not many foals get the chance to play with so many new toys fresh out of the box. I'd have to say you have the largest toybox in all of Ponyville! Well, once they're all unpacked, I imagine. Maybe you should see if some of your friends might want to come help unpack? You could make a party of it! I'm sure our resident party queen, Pinkie Pie, would love to help you plan it if you asked her." she tried to add a last-minute cheery comment in hopes of sparking an idea in the young colt. But she let him return to his desk and looked about the room. "Who wants to go next?" Grim had taken a seat somewhere in the middle of the class. He didn't want to look like he was lazy and hide in the back, or sit up front and seem like some sort of teacher's pet, so a central spot was best. As Scootaloo entered and then Sweetie Belle a light smile came to him. He still needed to write the Unicorn a song and with that thought a light blush came to his cheeks as he looked back to his desktop. 'I... I can go...' he spoke up when Champ was relieved of his speaking duty and then moved to the front of the class. Unlike the others, Grim hadn't taken off his bag yet. He never did. The teacher back home eventually gave up trying to get him to remove it and he hoped Ms. Cheerilee would be the same way. Miss Cheerilee kept an eye on Champ as he sullenly returned to his desk, then looked up and beamed as Grim stood beside his desk. Though she didn't look approving at his wearing of his saddlebags, but she'd talk to him about that after class. It simply didn't do to call a pony out in front of their peers, that was a fast track to resentment. But maybe she'd find out why he'd left them on after she'd thought she mentioned to put them under her desk. Ah, but youth! Maybe in his nervousness he'd just forgotten to take them off. No harm done. But she pricked up her ears as he approached her desk and turned around to face the rest of the class. She listened intently as she had with Champ, though Grim's story seemed to be much longer and more thought out. Just when she'd thought he'd finished, he kept going. Wonderful! She picked up her pencil and made a note to see if maybe he'd be interested in trying out for the Ponyville Drama Team. She gave him a look of encouragement as he paused and looked to the floor, making a little gesture with her hoof and gave him a smile before he continued. She thought about Willow Wisp, and wondered where she'd been staying. She hadn't heard of any pony by that name in town looking for a place to stay, but she remembered speaking with her during enrolling Grim for class, so she must have been living somewhere! Then she looked surprised. Ghost Stories? For such a little pony? Oh, but those could be so scary! She wasn't sure she approved, but if he really enjoyed them...and it seemed he did. He had a big cousin to look up to, that was practically immediate family and she definitely approved of that! Cheerilee almost began to applaud before Grim spoke up again, and she rested her hooves on her desk. Homesick? The poor colt. But a little town to the Southwest of Ponyville...that gave her an idea for a Geography Lesson. She felt they'd likely have time to put that in today, they had all year to really get down to the important lessons, so today was really more of a warm-up. She made another mental note; her mental filing cabinet was certainly filling up with notes today! Grim could probably use a little perking up after class. And she knew just the place. Then she almost gaped. A Haunted House? She didn't realize anypony lived there! She made it a point to visit with all of her students' parents and guardians at their homes at some point during the year. Maybe she'd have to see if Fluttershy knew of the place. As he finished speaking, she stood and clopped her hooves on the floor in applause. "Very well spoken, Grim. I can see you have a gift for story telling I should like to see develop during your stay here. I hope you enjoy living in Ponyville! Do be sure to stay after class is out, I have something I would like to share with you." she went back around behind her desk as Grim returned to him. After waiting for him to take a seat, she called out, "Who else would like to share with us what they did over the summer? Anypony?" "Teacher's pet..." The blue colt mumbled into his arms as he slumped into his desk seat once more, glaring to the front of the class. The little white foal had to join in with the applauds at Grim's story, how amazingly brave of him to be staying in a haunted house! It made him watch the colt in faint awe as he returned to his desk, despite what that big bully in the back row said. Suddenly a big flow of confidence came over him and he smiled brightly. Waiting for Cherilee to say the magic words before his hoof came flying up and waggled madly in the air to get the teacher's attention. "I do! I have a fun story of what I did!" Called out the now exciteable little foal, caught up in the energy of all the story telling. Gently scrambling off the chair he landed lightly on his rump before tottering to the front, a very brief, reluctant smile on his face as he saw those faces. Oh dear...maybe this wasn't a very good idea. But they'd told their stories! Even that big jerk Champ! Clearing his throat, he tried to imagine his parents either side of him and looked out over the students. "This summer I saw a lot of my aunty Spearmint's customers walk out of her surgery with nice bright, fresh teeth! There were some that got their teeth pulled and some fancy ponies that got their teeth cleaned and I got my check up by my aunty too!" He said, showing off his little pearly white chompers. "But the most exciting thing happened to me! More than dental care! I made some new friends, AND I got to meet two ex-Wonderbolts!" Whinnying excitably he held out his hooves to try and 'set the scene' as his daddy had once told him. "The first one I met when I was hiiiiiiiiiigh up in a tree, I was trying to fly but I got so scared! I thought I'd fall for sure! Then two pegasi came and helped me! Miss Fluttershy and mister Taxi, who was one of the Wonderbolts! He gave me a new scooter to help me make my wings strong!...I-I'm not very good at it..." Going a little pink, he went on with his story. "The second one was miss Star Chaser! She was making sure this filly was okay and she taught us both some super moves! I hope her wing gets better soon!" He then threw up his hooves slightly. "And my super special part of summer, was meeting my new friends, Scootaloo, Grim and Sweetie Belle! And it was the bestest summer EVER!" Whoo! Falling back on his rump he let out a few heavy breaths, that was a LOT to get out. But he felt so much better for it. The little colt certainly seemed eager to tell his story! She caught Champ's glare to the front desk, and splayed her ears, shaking her head a moment at him, before she brightened into a smile and nodded at Starlight. "Alright, Starlight, come on up!" She winced as he landed on his rump as he clambered out of his seat, then smiled again as the little bundle of white energy approached the front of the class. This one was the very embodiment of cheer, himself! She made a note to stop by Spearmint's place sometime, too. Not only was she the best dentist in all of Ponyville, she had such a great little student here and Cheerilee definitely wanted to tell her so. So many ponies to visit, so many places to go! It was such a good thing she knew Ponyville so well, or else she'd never be able to find them all! She was slightly taken aback by all of his energy and how descriptive he was being! Just like a little colt! She jotted down a note, Ponyville Drama Team for him as well! She'd make sure all of her students had something to look forward to after school! Even Champ. She hoped he'd try out for the Hoofball team again this year, divert some of that energy. But she wasn't even sure that all of Starlight's energy could be diverted into such constructive means either, he seemed to have so much! Perhaps Pinkie Pie would love another helper, too. She thought as she listened to Champ's story, leaning forward eagerly, then back with a gasp as his hooves shot into the air to describe his ride with Taxi! She didn't know the Wonderbolts by name, but she was familiar with their stunts! Cheerilee applauded as he came to the end of his story. What fun! This colt sounded like he had a -terrific- time over his summer! As he fell back on his rump, she stood up and clopped on her desk. "Very good, Starlight! That was such an exciting story! I'm sure you'll get better at your scooter soon. 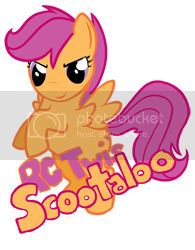 Scootaloo is very good on her scooter as well, I've seen her tearing through town on it, maybe she'd be willing to teach you some of her moves too? And I'm so glad you're making new friends! How very exciting! Who else wants to go next?" "huh? Oh... I guess I'll go... " she only realized everypony was telling their stories because she heard her name. This was happening just as she wrote down the last word or two of the paper she was suppose to have finished before she got here. She finished those couple of words, grabbed her paper and dragged her hooves up to the front of the class. After dropping her paper on Miss Cheerilee's desk Scoot got her story telling face on. "So this summer, me, Sweetie Belle and Apple Bloom went on tons of adventures trying to find our cutie marks. We were cutie mark crusader carpenters, cutie mark crusader chicken chasers, cutie mark crusader cookie eaters, cutie mark crusader zip liners, cutie mark crusader apple buckers, cutie mark crusader party throwers, cutie mark crusader muffin makers, cutie mark crusader musicians, cutie mark crusader tree fort builders, cutie mark crusader flower sniffers, cutie mark crusader hang gliders...." she went on and on without even a pause, if nopony stopped her she'd probably talk for 20 minutes trying to remember all the things the cutie mark crusaders did that summer. Twist was one of those foals - the ones who were always right on time to class, if not a little early - and was already perched at her chosen desk (near the front, but not so close as to draw attention) by the time most of the others started filing in. Her ears perked up as she heard Cheerilee mention names unfamiliar to her - Starlight, Grim - and she peeked up, muzzle still deep in her saddlebag where she'd been nosing around for her pencils and notepad. Hm. They weren't the only new colts either - she couldn't remember seeing the blue one before either. Well, maybe they'd turn out to be nice! Then again, maybe not. There was something about the blue colt that made her wary in a familiar way. Well, maybe the other two. She retrieved her supplies and set them on her desk, shaking frizzy mane from her eyes as she watched Cheerilee take charge of the class as always. What I Did Over The Summer. And no, Twist did not want to go first! It wasn't that she was particularly shy. And it wasn't that she'd had a bad summer, of course. She'd gotten to visit her grandma, and learn all kinds of new candymaking tricks - in fact, she had enough for the whole class stashed in her saddlebag! But... while Twist had never noticed before attending school regularly, but last year a certain pair of fillies had made her very aware that she didn't talk like other foals, and she remembered the sneers all too well. She didn't mean to, and she didn't see how it made much difference as long as everyone understood her, but... well. "She sells seashells by the seashore," she muttered under her breath. No. Still not right. But wait! Maybe she could talk about it without any of those pesky 's' sounds! Then she could make a good first impression with help from her candies, and get this year started right! A bit cheered by this resolution, she listened attentively as the new foals escibed their summers. A haunted house? And Wonderbolts? Wow! Champ's story was... well, less exciting; Twist wasn't sure how he could not like working in the toy shop, but everypony to his own likes, she guessed. She hoped they all liked candy. When Scootaloo spoke up Twist rested her chin on her desk, ears twisting briefly toward Apple Bloom. She'd wondered what Bloom and her new friends had been up to; she had seen very little of them over the summer, but had heard the tales and seen the aftermath of a few adventures. Maybe she could join them some time? Sure, she already had her mark and couldn't really explain how, except that making those peppermint candies just right had felt right, like a breakthrough... but maybe they'd want, oh, a mark-spotter on hand to see if anything was happening. She resolved to ask Apple Bloom, and slowly raised her hoof as Scootaloo chattered. She would go next, and show off her candies, and make a good impression for the new school year! Miss Cheerilee pricked her ears up as Scootaloo began telling her story. She was always eager to hear what the orange pegasus had to say, as one of the Cutie Mark Crusaders, Scoots certainly had any large number of interesting things she'd tried with her friends to find their cutie marks. Someday, Cheerilee told herself, they'd find them. But for now, they were just three young fillies having fun and being so serious while they were at it. She was sure they were going to be the best of friends. She looked forwards to hearing what Applebloom had to say when she was ready to tell her story about what she did. Though she looked around the classroom while Scootaloo was talking, and caught Sweetie Belle's eyes for a moment. The poor dear was so nervous about public speaking, but she's heard tell that the little unicorn had such a great singing voice...if only she dared apply it in public! Well, other than the Cutie Mark Crusaders talent show, though she had to give credit to all three for trying to hard and singing their little hearts out. They'd done such a great job that Cheerilee couldn't help but feel her heart swell with pride for the three of them. Friendship was what it was all about! As Scootaloo went on about the different types of 'jobs' they'd attempted, she gasped at some of the more dangerous ones, like ziplining! They could have been hurt! Though luckily they seemed to be okay. No broken limbs or wings! And cheerful nonetheless. That was important! Though she let Scoots talk on and on about the things she did until she'd finally come to exhausting her cutie mark job titles they'd attempted together. Maybe Applebloom or Sweetie Belle would want to expand a bit on that. After all, that was the whole point of telling their adventures! And it was supposed to be fun. Well, for some little ponies anyway. "Thank you, Miss Scootaloo. You certainly did have a lot of adventures this summer from the sound of it! Maybe the Cutie Mark Crusaders will have better luck in next month's Ponyville School Pageant? You can come get a flyer at the end of class if you like, but it's completely up to you." she gave the little pegasus a bright smile as she returned to her seat. Cheerilee made another mark on her paper. It was so very exciting hearing what each little pony had done, from the big to the small, and as she looked up and noticed Twist waving her hoof in the air, she knew she had her next volunteer! "Yes, Miss Twist? Would you like to go next? Come on up to the front of the class and tell us all about it!" "aaaaand we were cutie mark crusader ice cream testers!" she finished listing all the stuff she could remember, of course she didn't go into detail or tell any real stories. Just a big long list of crazy things the CMC had done that summer trying to find their marks. Scoot listened as Miss Cheerilee spoke "Thanks Miss Cheerilee I'll take a flyer!" The first enthusiastic thing she's said all class. Once Twist was called up to the front Scoot took the long way back to her desk so she could hug Sweetie Belle on the way there. She'd probably get in trouble but that was just fine with her. Scoot hadn't seen Sweetie all day, usually the two of them met up before class and Sweetie rode on her scooter but she wasn't around and the two of them were both late. So Scoot waited until Miss Cheerilee looked like she wasn't looking and gave Sweetie a big hug and then scampered back to her own desk. Once Starlight had found his way back to his desk, it took a little more scrambling and such to actually get onto his chair again. A bit of wiggling, a bit of beelike buzzing from his wings and the foal soon sat on his chair and watched Scootaloo tell the class about the cutie mark crusaders. It sounded so fun. He wanted to ask them more about it, see if it would help him learn to fly...because he was SURE learning to fly would get him his cutie mark for deffinate and true. It had to be. Resting his hooves on the desk, he heard through all the options in awe before Twist raised her hand to speak next. Meanwhile, Champ wasn't exactly as eager. Jeez, he could've fallen asleep in this class, muzzle burried into his legs that he'd crossed atop his desk, the colt slouched lazily. Stray and readied paper balls to chew sat by the side as he thought over the teacher's words, a party for all his friends? Like he wanted to be friends with these lame-o ponies. A small snort escaped his nostrils and he leisurely rolled one well gnawed pencil over the surface of the desk. He missed Dusky and Chip and all his other friends from Fillydelphia, he missed his gym teacher, Coach WeatherBee...and he missed his old house. Where him, his dad...and his mom, used to live and he sunk into his shoulders slightly as his memories wandered over his older years in his home town. Walking back home and playing hoofball with Dusky and Chip, running away from the neighbours dog through the fence like it was a wild lion in a cage despite its limbs being riddled with arthritis. Coming home to the smell of fresh baked cookies...and his mom. Standing there in a clean bright white apron and ready to hug his little brains out. Snapping out of his daydream, he peered at the frizzy, red maned filly upfront and twitched slightly. The queen of dorkitude herself. Groaning he slumped his chin onto the desk with a thunk and stared ahead. Twist paused just before the 'Miss Cheerilee'. Drats! Her plan to avoid the difficult sounds left her without a good way to address the teacher! Well... she would have to figure that out later. The filly dipped her nose into her saddlebag to retrieve her bag of candy and trotted to the front of the class, setting the treats on the desk before turning to address her fellow students. "I went to Manehattan for a month - my grandmother moved there awhile back to live with my aunt!" she said brightly. So far so good - maybe this was actually going to work! "Grandma taught me to make candy a long time ago, and I really love it! And during my month in Manehattan, she taught me a new way to mix more than one flavor into a candy cane." Twist smiled and turned to nudge her bag open, showing off colorfully striped peppermint sticks - some had green striping with the pink and white for spearmint, others were blueberry or even orange striped, one or two were even licorice (Twist didn't like it, but apparently some ponies loved it). She paused a moment, head tilting. "I brought enough for everypony - who wan--" Brief pause - she'd almost slipped up! "Um, who would like candy cane number one?" That sounded weird, but maybe it was less noticeable than her lisp. She paused, remembering something, and looked sheepishly over at Cheerilee. "Um... if you don't mind, I mean." The purple mare smiled from behind her desk as Twist enthusiastically approached the front of the class, carrying a bag. From the smell of it, it must have been some of Twists' candy! They were always so good. She'd heard about how Twist had aquired her cutie mark just hours before the party that had turned into such a success for a certain three little ponies. Meanwhile, she hadn't seen AppleBloom hanging out with Twist as much since, and she hoped that Twist wasn't lonely even though she was likely to have a permanent job anytime now. Most of her little ponies of varying ages tended to find employment shortly after their cutie marks were discovered, in the areas they were best suited for. Most of them, anyway. Some of them tended to find work in fields that were close. Cheerilee's old classmate Rarity, for example, had discovered a talent for finding gems along with her talent of fashion, so she had pretty much set herself up as a fashionsta with two really lucrative talents few ponies could match. Maybe someday one of these little ponies could follow in her hoofsteps! A trip to Manehattan? That sounds exciting! Cheerilee couldn't remember the last time she had gone, maybe she should make a trip sometime. It was such a big city! Multiple flavors in one candy cane? This she had to try! Normally she wouldn't allow candy during class, but..maybe she'd make an exception in this case. It was the first day, after all and Twist was so eager to share her treats with the class. And they smelled so good. "Oh!" exclaimed the teacher as Twist had finished up her story. "I think I would like one, Twist. You can pass them out if you like, but just this once. A short but nice report! Maybe we will take a field trip to Manehattan someday. If your parents or guardians give permission, of course. " "After Twist has passed out her treats, is there any pony who would like to go next? " her eyes searched around the classroom until they fell on the ever-shy Sweetie Belle. She hoped someday soon the little pony could muster up the strength to come in front of the class and show off her beautiful voice. But...maybe today? The white colt instantly perked up...candy? Sweet candy? Eyes widening, he noticed a few others of the class stare forward with wide, hungry eyes also at the rather tasty looking treat that had been offered up for all of them by the nice filly up front. Starlight loved candy, despite how much his aunt tried to talk him out of it, he WAS only a pony and a little pony at that and little ponies loved candy. He was sure his aunty loved candy at some point...but maybe it had diminished with her love for clean teeth. They should've invented a candy that could clean your teeth. That wouldn've been the BEST invention EVER! So the little white pegasi waited at his desk to see if the candy would be share out and as soon as miss Cherilee said yes, he mentally felt himself leaping for joy...despite the fact that thankfully he never carried out the actual action. And just sat there...brimming with joy atleast. Watching the lisping filly meanwhile, Champ was too 'amused' trying to balance a pencil on the top of his nose than listen to the spluttering red head try to get a coherent word out about candy or something stupid like that. Sharing the candy out? He had a sneer a little at that, all that mane, he was shocked the candy cane's didn't look covered in fuzz by now and hid his snicker with expertly laced venom as he sat there despite the sentiment of his dislike lay heavy on his face. Glancing around for any of the students, he only found that the little unicorn he'd laughed at the other day was one of the few that had yet to speak. Jeez, the faster she spoke. The faster this class was -over-. Looking over the paper wads and straw, he let the front be distracted by Twist as he chewed up some of the paper and aimed the straw for Sweetie Belle's blank flank. Stay on target. Not hard enough to pierce the skin, but certainly enough to jolt her up so that the teacher -had- to think she was volunteering herself. Then she'd have no choice. Taking a puff of air, the wad of paper shot out with Sweetie's flank in pursuit.